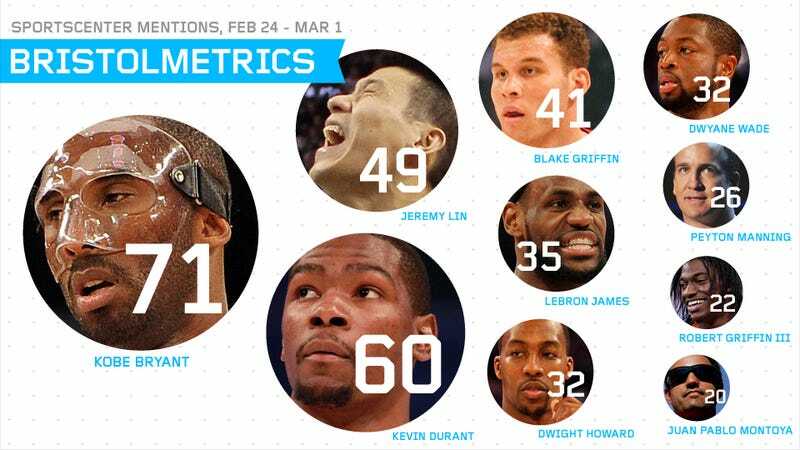 When last we met, Linsanity was trending downward, but still breaking records. What would this week bring? Monday's SportsCenter was all over the Daytona 500 hellfire: ESPN's handling of the Juan Montoya crash in the rescheduled Daytona 500 was fascinating to watch, and not just because it looked as if the apocalypse had arrived down by the Halifax River lagoon . Because of the two-hour-plus delay, race coverage spilled over into the 11 p.m. SportsCenter. Scott Van Pelt and Stuart Scott had to give viewers live updates on the delay as they were coming in. The two also conducted a phone interview with NASCAR analyst Marty Smith for 5.25 minutes to get some perspective on what the drivers were doing during the pause and whether they would be able to finish the race that night. The result? Montoya was one of the week's most-name-checked athletes, and Danica Patrick was the first woman to crack the Bristolmetrics most-mentioned list. Also, the terms "jet dryer" and "jet fuel" were used a total of 24 times on Monday. Jeremy Lin has a quiet week: Lin was mentioned "only" 49 times this week, and the Knicks were on SportsCenter for just six minutes, down from 69 minutes of coverage the previous week. Of course, the Knicks played only once during this week's tally. The Red Sox chicken and beer saga continues, somehow: It's the story that just won't die. This week, 2.25 of the 2.5 minutes of airtime given to the Boston Red Sox was related to the moronic "revelations" out of Boston's clubhouse that players ate chicken and drank beer. SportsCenter was all over it, frantically blowing on the story's dying embers: interviews with players saying they wanted to move on from the story; the team announcing it would now ban beer; former manager and current ESPN analyst Terry Francona saying the ban was nothing more than a PR move. Current Red Sox manager Bobby Valentine made news this week by saying Derek Jeter was out of position when he threw out Jeremy Giambi at the plate in the 2001 ALDS. That story took up 1.25 minutes this week. The best part was that ESPN actually followed up with Jeter and got his response on camera. For a play that took place a decade ago. The Yankees and the Red Sox always bring out the worst in the Worldwide Leader.